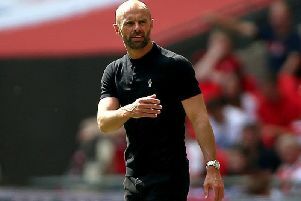 Rotherham manager Paul Warne hailed his side’s resilience and battling qualities as Michael Smith scored just his second goal of the season to salvage a point at Preston. Rotherham registered back-to-back points on the road thanks to a 1-1 draw at Deepdale and Warne was delighted with the fighting spirit his side displayed. The Millers secured their first away point of the season at Middlesbrough in midweek, and Smith cancelled out Tom Barkhuizen’s opener as Rotherham drew their third consecutive match. Warne said: “I think the lads did enough to get a draw. Smithy had a great chance in the first half which smacked the post and their keeper has made a great save off Vas (Kyle Vassell). “But we got a deserved goal and I think we were more than deserving of a point to be honest. “I was disappointed with the first half, I thought we took too many chances in the middle of the pitch which I’d told my lads not to. “I just didn’t think we were quick enough and forceful enough in the first half and I asked us to play differently in the second half. “But this group have unbelievable character. I’m really pleased with what they’re trying to do here. “After we rode the initial storm we were really in the game. It was disappointing we conceded the goal when we did because we were having a good spell. We were on the front foot. Preston North End: Maxwell, Clarke, Huntington, Davies, Hughes, Pearson, Johnson (Gallagher 72), Barkhuizen (Moult 75), Browne, Robinson, Nmecha (Maguire 64). Unused substitutes: Rudd, Fisher, Earl, Storey. Rotherham United: Rodak, Vyner, Ajayi, Robertson, Mattock, Vaulks, Taylor (Newell 68), Towell, Vassell (Proctor 76), Williams (Manning 85), Smith. Unused substitutes: Wood, Palmer, Price, Wiles.